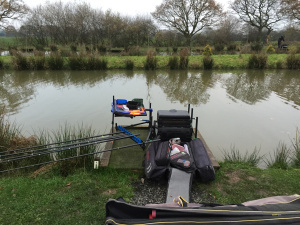 I am only able to get out once a week at the moment and with the Saturday open to be held on Covey 5 + 6 as it was the week before, I chose this day. I haven’t fished Covey 6 before so I was hoping to draw on this lake and I wasn’t left dissapointed when I drew peg 155 on Covey 6. Both pegs 157 and 149 had framed the previous Saturday, so I was pleased with my draw and hopefully I would be in a good area and catch a few fish. This entry was posted in covey six, PARTRIDGE LAKES COVEY. Bookmark the permalink.